Sept. 26: Could 2012 Be Like 2008? There’s no point in putting it gently: Mitt Romney had one of his worst polling days of the year on Wednesday. It began with a series of polls from The New York Times, CBS News and Quinnipiac University, released early Wednesday morning, which gave President Obama leads of between 9 and 11 points in Florida, Ohio and Pennsylvania. Later in the day, Mr. Romney got polls showing unfavorable numbers for him in Colorado and Iowa. Unlike many recent days, when Mr. Obama’s national polls were slightly less euphoric than his swing state surveys, Wednesday’s national polls seemed to support the notion that Mr. Obama has a clear lead in the race. The Gallup national tracking poll gave Mr. Obama a six-point lead among registered voters, close to his high mark on the year in that survey. The online tracking poll conducted by Ipsos gave him a six-point lead among likely voters. Another online tracking poll, from the RAND Corporation, put Mr. Obama’s lead at roughly seven and a half percentage points, his largest of the year in that poll. And a national poll for Bloomberg produced by the pollster J. Ann Selzer, who has a strong track record, put Mr. Obama six points ahead. What to think of the Rasmussen poll? Their surveys usually have a Republican lean, but it seems to have gotten stronger in the last few weeks. It has also been stronger in some years than others. Rasmussen got reasonably good results in years like 2006 and 2008 when their polls were close to the consensus. However, their polls were the least accurate of the major polling firms in 2010, when they had an especially strong Republican house-effect. The same was true in 2000, when they had a three- or four-point statistical bias toward Republican candidates. This feature is not unique to Rasmussen Reports: a poll that substantially differs from the consensus, whether in a Democratic or Republican direction, is usually not one that you’ll want to bet on. And there is even less reason to do so when a poll is taking a number of methodological shortcuts, while others are being more thorough. But there have been years when the whole polling average has been off in one direction or another, and the “outlier” polls turn out to look good. It’s also the case that a broken clock is right twice a day. We’re at a point in the race, however, when it’s important to contrast what we think might happen on Nov. 6 with what we’re seeing in the polls at the moment. Right now, there is a gap between these two things. Although Mr. Obama is now the clear favorite in the Nov. 6 forecast, his advantage is larger in the FiveThirtyEight “now-cast,” which projects what would happen in an election held today. The “now-cast” estimates that Mr. Obama would have a 97.8 percent chance of winning an election held today. Further, it pegs his advantage at five and a half percentage points in the national popular vote. By contrast, the Nov. 6 forecast expects Mr. Obama to win by a smaller margin, 3.6 percentage points, on Election Day itself. Two things account for this disparity. First, there are still some effects from the convention bounce penalty that the Nov. 6 forecast applies to Mr. Obama’s polls, but which the “now-cast” does not. The convention bounce adjustment is phasing out of the model, but it hasn’t done so completely. Second, the Nov. 6 forecast is still using economic data along with the polls. By design, the economic component of the forecast receives less and less weight over the course of the year, since it becomes less and less likely that there will be predictable effects from economic news that are not already priced into the polls. (By Election Day itself, the economic component of the model will phase out completely, meaning that the forecast will become equivalent to the “now-cast.”) For the time being, however, the economic index still accounts for about 30 percent of the forecast. The way that the economic index evaluates the data, Mr. Obama is the favorite in the race. However, he is only a slight one, and the economic index has been declining recently, following a poor report on manufacturing activity and a decline in the stock market over the last week on renewed investor concerns about Europe. Mr. Obama is considered a modest favorite by the economic model because he is the incumbent president, and incumbents are favored given average economic conditions. The economy is decidedly below-average, but it is not recessionary, and there have been just enough bright spots in the data that Mr. Obama remains in the buffer zone where his incumbency advantage could outweigh it. However, the economic index would point toward a two- or three-point win for Mr. Obama in the popular vote, rather than the five- or six-point advantage that he has enjoyed in the most recent polls. Thus, the economic index is exerting some downward pressure on Mr. Obama’s Nov. 6 forecast. If the election were held today, however, it could look pretty ugly for Mr. Romney. The “now-cast” has Mr. Obama favored in all the states he won in 2008 except for Indiana, where he is several points behind, and North Carolina, which it shows as an almost exact tie. It would project Mr. Obama to win 337 electoral votes, slightly fewer than the 365 that he won in 2008. Beneath the surface, however, there are some bigger differences in the individual states. 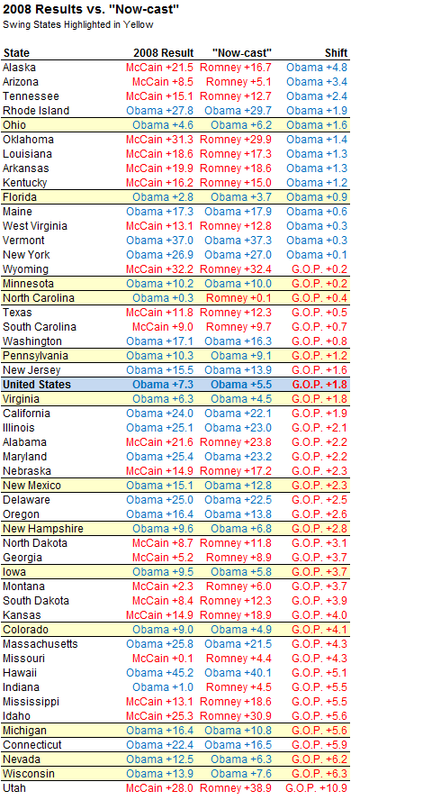 In the table below, I’ve compared how Mr. Obama performed in each of the 50 states in 2008 against what the “now-cast” estimates would happen in an election held today. · Three states in New England: Vermont, Maine and Rhode Island. There is an interesting split this year among the six New England states, with Mr. Obama running very well in these three, which are poorer, but not as well in Connecticut, New Hampshire and Massachusetts, where voters are better off. · New York, where Mr. Obama’s numbers have been quite strong in the polls, and which has gone from a state where Republicans could sometimes compete into one that seems completely lost for them. · Finally, two swing states: Florida and Ohio. The utter weirdness of this mix – how often do you see Ohio, New York, Kentucky and Vermont on the same list? – is one reason to be skeptical that either candidate has all that much of an advantage in the Electoral College relative to his position in the popular vote. With Mr. Obama’s strong run of polling in the swing states recently, the model has reverted to figuring that he would have just the slightest Electoral College edge in an election in which the popular vote were exactly tied. But it is a slight advantage indeed: the model estimates that Mr. Obama would have a 53 percent chance of winning the Electoral College under those conditions. If Mr. Obama were to choose any two states in which to overperform, Ohio and Florida are pretty good picks, and both represent huge problems for Mr. Romney. It is too late in the race, and there are too many polls there, to write off Mr. Obama’s polling in these states as a fluke – although the set of Quinnipiac polls certainly present a rather optimistic case. Mr. Obama is also polling fairly close to his 2008 levels in Minnesota and Pennsylvania, two states that Mr. Romney has not contested as vigorously as John McCain did four years ago. Some recent polls also show Mr. Obama near his 2008 numbers in Virginia and North Carolina, where demographic and cultural shifts seem to be working in favor of Democrats. But there are a number of other swing states in which Mr. Obama is still polling well off his 2008 pace. Mr. Obama’s numbers have perked up in Iowa and Colorado, for instance – but polls are suggestive of a lead for him in the mid-single-digits there, when he won both states by nine percentage points in 2008. Mr. Obama is a heavy favorite in Michigan, but is highly unlikely to replicate his 2008 performance, when Mr. McCain pulled out of the state early and he won it by more than 16 points. He is also unlikely to duplicate his 12-point margin of victory in Nevada, where economic conditions are so poor as to be almost depressionary (Nevada’s median household income fell to $47,043 in 2011 from $54,744 in 2008) — or in Wisconsin, in which Paul D. Ryan should help Mr. Romney at least a little bit. Because he won some of these states by such a wide margin in 2008, Mr. Obama has a lot of cushion in them. Michigan, in particular, looks all but lost for Mr. Romney, and Wisconsin may be getting that way. But in order to say that Mr. Obama had an especial advantage in the Electoral College relative to his standing in the popular vote, we’d need to see at least one or two more of these states start polling in the high single digits for him, as Ohio now is. If Mr. Obama were polling three points better in Colorado than our current estimate has him, for instance, he’d win the Electoral College in about an additional 2 percent of the time, making him almost an 85 percent favorite, with most of those additional wins coming in cases where he lost the national popular vote. If Mr. Obama did this in two or more of these states – say, Colorado and Nevada, or Iowa and Virginia – we might say that Mr. Obama had really developed a “blue wall.” Right now, we’re not quite able to do that. His highly favorable numbers in Ohio and Florida lately offset other swing states where he’s likely to underachieve his 2008 numbers by several percentage points. Still, this Electoral College discussion is going to be academic unless Mr. Romney can reverse his poor run of polling. We’ll conclude with a scary thought for Republicans. Right now, the Nov. 6 forecast projects that Mr. Obama will win the popular vote by 3.6 percentage points. As I mentioned, that does account for about a two-point decline from where Mr. Obama seems to be in the polls right now. Otherwise, however, the model assumes that the uncertainty in the forecast is symmetric: Mr. Obama is as likely to overperform it as underperform it. If Mr. Obama misses to the downside by 3.7 percentage points, then Mr. Romney would win, at least in the popular vote. However, if Mr. Obama missed to the upside by 3.7 percentage point instead, he’d win the popular vote by 7.3 percentage points, exactly replicating his margin from 2008. In other words, there looks to be about a 20 percent chance that Mr. Romney will win, but also about a 20 percent chance that Mr. Obama will actually beat his 2008 margin in the popular vote. The smart money is on an outcome somewhere in the middle – as it has been all year. But if you can conceive of a Romney comeback – and you should account for that possibility – you should also allow for the chance that things could get really out of hand, and that Mr. Obama could win in a borderline landslide.